Century Cycles Blog: U.S. Bicycle Route System: Build It. Bike It. Be a Part of It! U.S. Bicycle Route System: Build It. Bike It. Be a Part of It! Beginning today and throughout National Bike Month (May 2011), Adventure Cycling Association is working to raise $30,000 to support the creation of an official U.S. Bicycle Route System (USBRS) -- once complete, it will be the largest official cycling route network in the world! 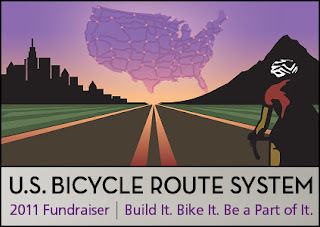 Donate $10 today to support the creation of a national network of bicycle routes: the U.S. Bicycle Route System, a visionary project that will be similar to the national and international systems blossoming across the globe, such as Euro Vélo. The routes will connect cyclists across the U.S. with cities, transportation hubs, scenic and historic destinations through existing (and new) infrastructure; routes will be numbered, mapped, and officially recognized by state and federal government agencies. 30 states are already working to implement U.S. Bike Routes -- donate today! Want to help spread the word about this campaign?